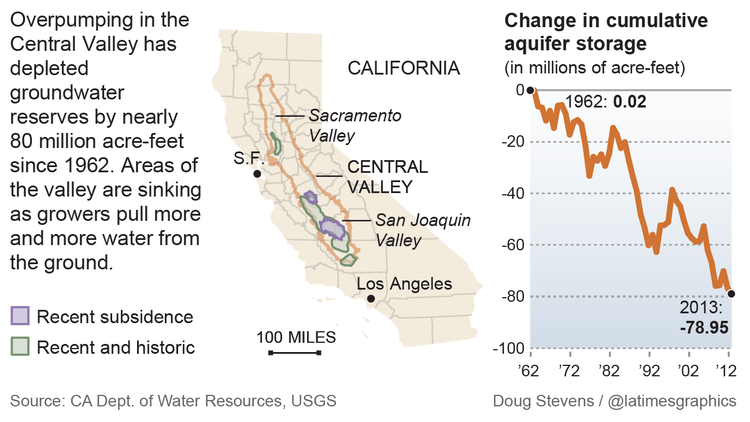 Overpumping of water wells in drought-plagued California is making the earth in the San Joaquin Valley fall a half-inch each month as groundwater supplies are depleted, Bettina Boxall reports for the Los Angeles Times. "The land subsidence is cracking irrigation canals, buckling roads and permanently depleting storage space in the vast aquifer that underlies California's heartland." The main problem is that the Central Valley aquifer, which extends for about 400 miles under the Sacramento and San Joaquin valleys, has for years been largely unregulated and unmonitored, allowing landowners of the more than 100,000 wells to take as much water as they want, Boxall writes. "Scientists estimate that since the first wells were drilled by settlers more than a century ago, pumping has depleted Central Valley groundwater reserves by 125 million acre-feet. That is about four and a half times the capacity of Lake Mead, the biggest surface reservoir in the country. About 20 million acre-feet of that loss occurred in the last decade." Legislation, which is strongly opposed by agricultural groups, calls "for the creation of local groundwater agencies that have more than two decades to fully comply," Boxall reports.